Should I use the camera viewfinder or LCD? More importantly, in the age of iPhones and touchscreens, is the viewfinder now obsolete? Read on, and you may just discover a need for both. Is the LCD better than the viewfinder or vice versa? Should I use the camera viewfinder or LCD when capturing an image? Indeed, this debate will no doubt continue into the foreseeable future. At any rate, long before the liquid crystal display (LCD) came into the picture, the viewfinder was the only game in town. Thus, it certainly stands to reason why many seasoned photographers prefer the viewfinder over the LCD. However, in light of the miniature camera revolution, one might consider the viewfinder outdated or even obsolete; consequently, many contemporary photographers appear to favor the LCD. In any case, the LCD has changed the game and offers distinct advantages and new possibilities for photography. Regardless of your current preference, a bit of experimentation may help improve your game. Above all, the composition is the most crucial element in any photograph. Indeed, everyone enjoys a stunning well-exposed tack sharp photo. Of course, the methods used to capture an image play an essential role in the quality of the image. For example, during hand-held photography, using the viewfinder draws the camera closer to the body offering a lower profile thus providing a better foundation as opposed to extending the camera forward to compose an image. Naturally, getting the shot is what counts! Deciding between using the LCD or viewfinder boils down to personal preference. Should I use the LCD because I wear eyeglasses? Although wearing eyeglasses can exacerbate the situation, it’s still possible to use the viewfinder. However, whether farsighted or nearsighted, fumbling around with eyeglasses can take the fun out of photography. Fortunately, many cameras offer viewfinders with a built-in diopter that permits one to compensate for optical shortcomings. In fact, some camera models offer additional diopters for those requiring further correction. Honestly, while wearing reading glasses, I do find it a bit cumbersome to bounce back and forth from the viewfinder to the LCD. I sometimes wear my glasses tethered around my neck. At any rate, I find using the viewfinder worth the extra effort. What about composing images low to the ground? No doubt, shooting at ground level can make framing an image extremely difficult. Composing a photograph with the viewfinder while lying on wet grass presents an unacceptable challenge for some people. Still, using the LCD does not guarantee the user will remain completely dry, even with a tilting LCD. Plus, not all cameras have an adjustable LCD. Nevertheless, the increasing popularity of the adjustable LCD suggests many people may favor the LCD over the viewfinder. Although I prefer the viewfinder in most situations, the LCD occasionally has its advantages. Regardless of one’s preference, an adjustable LCD has an undeniable ergonomic benefit when shooting at low levels. On the other hand, for the diehard viewfinder fan, it is possible to retrofit many camera models with an angled viewfinder. How much of the image will I see in the viewfinder vs. the LCD? While composing an image, a mindful photographer pays careful attention to every detail in the frame, especially distracting elements near the edges. Unfortunately, excluding high-end cameras, most DSLR viewfinders do not offer 100 percent coverage. For example, when using a DSLR with only 95 percent coverage, during post-processing one is likely to discover overlooked articles near the edge of the image. Whereas the articles would have been visible if composed on an LCD. In other words, unlike the LCD, what you see in the viewfinder isn’t necessarily what you get in post-processing. As for myself, this is an outright deal breaker. Although many camera models offer viewfinders with greater than 95 percent coverage, nothing beats 100 percent. On the other hand, is five percent more coverage worth the added expense? Honestly, the deciding factor comes down to personal preference and budget. Viewing an image on an LCD in brightly illuminated situations may prove difficult indeed. When shooting under extremely bright conditions, one may find it impossible to actually see the image on the LCD. Although I certainly prefer the viewfinder in bright situations, purchasing an LCD hood or shade provides a simple solution. Though an LCD hood will help reduce glare, these devices are bulky and require removal to use of the viewfinder. Honestly, the LCD has its benefits, but in this case, why add an additional device if it’s not necessary. Which is better for night photography? I occasionally hear the notion that bright light from an LCD impairs night vision. Of course, staring at any bright light source will affect one’s night vision. Be that as it may, I would not rule out using the LCD for night photography. In fact, I often use the LCD at night for image playback, and I’m yet to stumble over my gear from loss of night vision. In any case, both the viewfinder and LCD are beneficial for night photography. Incidentally, while shooting a moonbow at Cumberland Falls State Park near Corbin Kentucky, I found the LCD indispensable in reviewing the color span captured in the moonbow. Due to sparse lighting, the human eye has a difficult time discerning the colors of a moonbow, and thus it appears white to the naked eye. Nevertheless, during image playback on the LCD, the colors in the moonbow are evident. See the moonbow here. What camera data is available in the viewfinder vs. the LCD? Depending on the camera model, the information available in both the viewfinder and LCD will vary. Regardless of the camera data, with today’s technology, most people have no trouble pointing and shooting a camera with satisfactory results. However, being acquainted with the exposure triangle can open new possibilities with the potential for boundless creativity. Hence, the ability to observe shutter speed, aperture, ISO, and exposure is paramount. One advantage of the LCD is the ability to view a live histogram in live view. Truly, a live histogram is pretty impressive, but not available on all cameras. In any case, I prefer to use the histogram during image playback. What’s the difference in battery life when using the LCD? Now, this is extremely important for those that need to squeeze every ounce of life from a battery. I often hike and camp in primitive areas where electrical power is a luxury. That being the case, the difference in battery life is monumental! An LCD requires far more energy compared to an optical viewfinder. In fact, the LCD requires 100 percent more energy. However, poor battery life is easily mitigated in most cases. For example, carry extra batteries and take advantage of charging opportunities while traveling near power sources or while dining in a restaurant. Also, consider investing in a battery grip. Does live view offer better focusing? Depending on the type of photography, both the viewfinder and LCD have distinct advantages. For example, live view employs contrast detection to analyze image contrast pixel by pixel thereby significantly improving focusing accuracy. Furthermore, live view provides additional focusing points allowing more versatility, especially handy when the camera is mounted on a tripod. Utilizing the LCD, one can zoom in and precisely focus on a specific detail. Consequently, a landscape photographer may favor using the LCD to enhance the focus of still subjects. However, the focusing speed is at a snail’s pace compared to using a viewfinder which employs phase detection for focusing. For this reason, a sports photographer would likely opt for the benefits of the viewfinder. In fact, because of its quick and reliable focusing, phase detection yields better results for fast-moving subjects. Indeed, a sharp image is the benchmark of any serious photographer. With this in mind, understanding the fundamentals of phase detection and contrast detection is instrumental. Should I cover the viewfinder when using the LCD? Indeed, whether using the LCD or viewfinder to compose an image, covering the viewfinder eyepiece on a DSLR is an excellent idea. In fact, in backlit situations, it’s possible for light to enter through the viewfinder and appear on the image as a solar flare. Moreover, light entering through the viewfinder can fool the camera’s light meter resulting in an underexposed image. Despite manufacturing attempts to protect against light leakage, even the most expensive cameras can leak light back to the sensor. In fact, with the mirror in the up position, light may still pass through and find its way to your image, especially during a long exposure. Consequently, and for a good reason, many manufacturers deploy the use of built-in eyepiece shutters or external eyepiece covers. Why leave your masterpiece to chance? 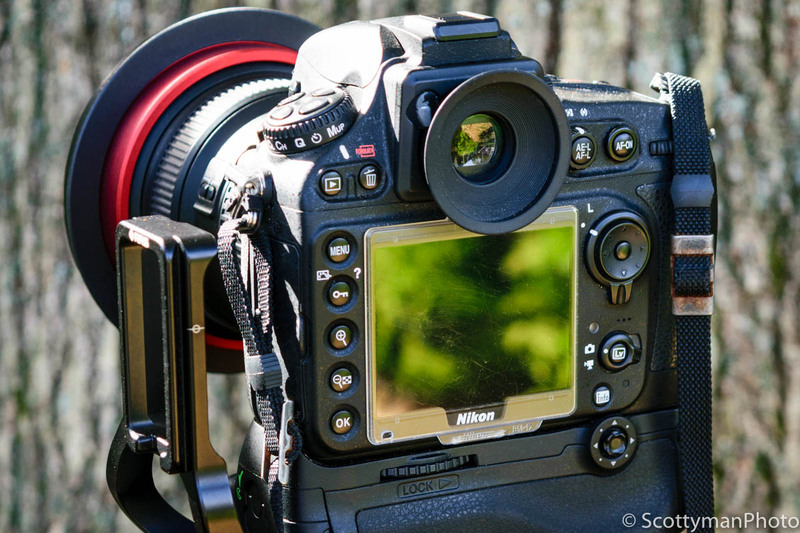 A DSLR utilizes a mirror to reflect an image through the lens and onto the sensor. Obviously, a “mirrorless” camera does not use a mirror to reflect an image to the viewfinder. Instead, a mirrorless camera projects an electronic or “digital” image to the viewfinder. I think an electronic viewfinder (EVF) is much like an LCD only smaller. As a matter of fact, an EVF is analogous to having a tiny TV screen extremely close to your eye. Alternatively, an optical viewfinder (OVF) allows the user to look straight through the lens via the mirror. Nevertheless, both the OVF and EVF provide the user with a practical view; however, the two views are entirely different. How does the EVF compare to the OVF? Viewing an image through an EVF is much like living in the Matrix. The world seen through an EVF is an electronic reproduction of reality. “You’ve been living in a dream world, Neo.” Despite my poor attempt at a little Matrix humor, there is much truth in that statement. Indeed, I would rather view the real world through an OVF as opposed to a replica through an EVF. Nevertheless, the EVF does have a few advantages. For example, like the LCD, the EVF offers 100 percent coverage, so what you see in the viewfinder is what you get in the image. Also, the EVF is illuminated and thus beneficial in low-light situations. So, is the EVF better than the OVF? Despite having a few benefits, none outweigh the advantages of the OVF in my humble opinion. Honestly, zero lag time and image clarity alone provide sufficient reason to opt for the OVF. At any rate, it’s important to note that no two photographers are alike, and every situation is unique. As a landscape photographer, I truly appreciate the magnificence of nature and embrace any occasion to connect with it. Therefore, unlike the EVF, the OVF allows me to view a composition in its true color and natural brilliance. Still, the choice resides with each photographer to decide what works for their particular circumstance. In the end, it’s all about having a grand experience and possibly heading home with a magnificent image! Although I do my best to remain objective when writing, I’m sure it’s apparent that I prefer the viewfinder over the LCD. Despite that being the case, you may have noticed that I practice both in my photography. Honestly, I suspect many people do the same. Indeed, I very much enjoy the connection to nature that photography affords. Although an LCD has its benefits, I prefer viewing my subject through the sharp clarity produced by an optical viewfinder. In short, if forced to decide between one or the other, I choose the OVF. At any rate, these are mere opinions and should be taken with a healthy portion of common sense and personal experience. As I always like to say, it’s genuinely a matter of personal preference. Better posture resulting in sharper images in hand-held photography. Extended battery life as opposed to the LCD. Provides a natural light box reducing distractions. Zero lag time in the display. No glare on the screen. Easier to compose images at ground level. Displays 100 percent of the image. Option to zoom in for precision focusing. Easier to use with eyeglasses.